Wednesdays I will write about things like TV shows, films, books, websites, YouTube channels, or anything else I happen to be into on any given week. I happened to see The Hunger Games: Mockingjay Part 1 in theatres today. It’s difficult to make a film based on a book with such a large fan base. It’s even more difficult to make a film based on half a book. Mockingjay Part 1 is the third film of the Hunger Games series based on the popular trilogy by Suzanne Collins. Because the film depicts the events that occur in the first half of the last book, it did go along a bit slow, but it stayed true to the story. However, the film was able to expand the story beyond Katniss Everdeen’s point of view, whereas the book was told solely from her perspective. Katniss is the now-seventeen-year-old who was swept into a struggle between the rich Capitol and the rest of the nation that provides for it and suffers under it’s rule. Over a year after the events at the beginning of the first movie, the film finds Katniss suffering from Post-Traumatic Stress Disorder and worried about Peeta, who is now in the clutches of the Capitol. But while her concerns may be focused on the loss of someone who had been with her throughout the games, a war is starting and around her swells political unrest. As the revolution continues to grow, Katniss’ part in it becomes smaller in comparison, although more defined. Her image is used by President Coin, leader of the rebels, to inspire the rebels across the country and spread propaganda. The scenes which showed actions being taken by rebels who’ve been inspired by Katniss were awesome and I very much enjoyed their addition. In the book they were little more than passing commentary, but it brought to light how serious the situation was. The film also found a good way to create a climax in half a story. 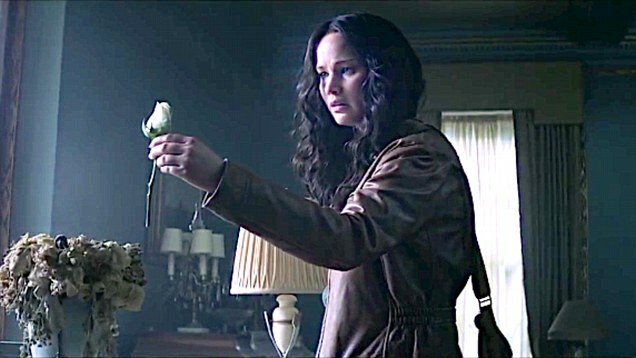 They spliced the operation to save Peeta with the groundbreaking revelations against President Snow by Finnick Odair so that the focus could be on two things at once without everything becoming too difficult to follow.The song ‘The Hanging Tree’ was particularly well-done and brought chills as the film used it to show how much of an impact Katniss had. Jennifer Lawrence is without a doubt an excellent actress and while it’s a bit of a stretch to think of her as a seventeen-year-old half-deaf mixed-race girl, she played the part well enough that I didn’t really care. Although dealing with such difficult topics, especially topics that have been especially relevant in 2014 with so many protests happening across the globe, the film managed to find humour and insert it into the film without distracting from the seriousness of the story. All-in-all, I’m sure it was a difficult film to make, but Mockingjay Part 1 managed to pull everything off with taste and detail. In fact, I would say this was my favourite of the three films that have so far been released. It’s especially impressive because the third book was the most disappointing in the trilogy, to me. Have you seen the film? Tell me what you thought below! Also, try to guess what posts I’ll do on Thursdays. It’s the only day of the week I haven’t revealed, so try to think, what haven’t I done yet? Now jet lag has caught up to me. Goodnight!